This fall, Sue O’Malley brought her passion for healthy eating and gardening to Project Place. She is engaging clients in a series of workshops where she teaches nutrition and gardening. She also helps clients identify and access the fresh food resources available to them in Boston. In Sue’s last workshop, clients set up an herb garden on the 6th floor of the Project Place building. They planted chives, basil, lettuce, kale and Swiss chard from seedlings. The plants are currently growing on shelves of planting trays with growing lights. After the plants mature, the herbs will be used in Project Place’s kitchen, where lunch is served daily to clients and staff. Sue has been involved in urban gardening for a little over ten years now. She started off working on school garden projects, where she came to realize how little the students knew about nutrition. 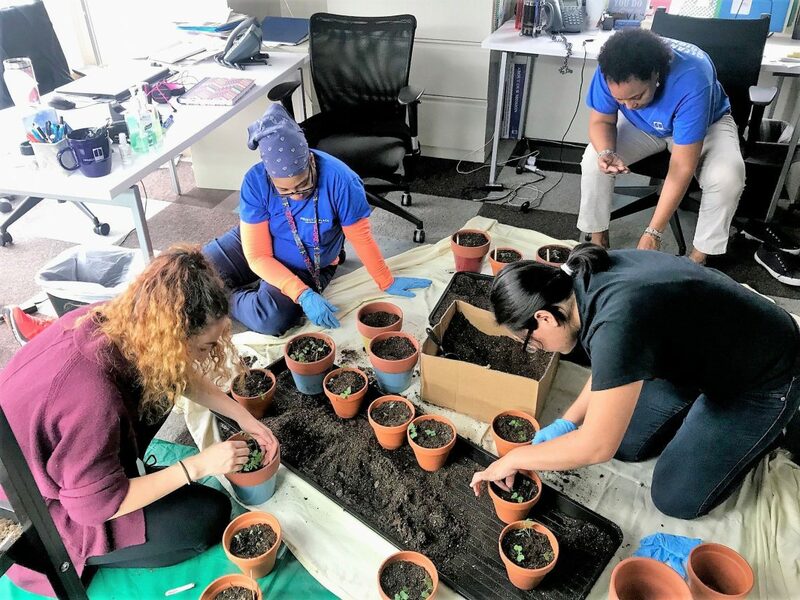 These gardening projects opened her eyes to the disparities that exist in terms of nutrition education and fresh food access. She has since made it her mission to find ways to connect low-income populations with fresh produce. After visiting Project Place, Sue saw a perfect opportunity to get involved and provide additional resources to clients. Sue has donated all the materials used in the herb garden project, and is currently preparing for her next workshop.